The dress Angelina Jolie wore when she married longtime love Brad Pitt has finally been revealed, and it might start a trend in child-illustrated wedding gowns. Yep, this one's one for the books -- of the coloring variety. The "Maleficent" star's whimsical wedding ensemble was designed by Atelier Versace's master tailor Luigi Massi and the power couple's six children, according to People, which obtained exclusive photos of the Aug. 23 wedding in conjunction with Hello magazine. Jolie's traditional white gown had the children's work all over it -- literally. The kids' drawings and doodles emblazoned the back of the gown and peppered Jolie's veil for the nuptials, which took place at the couple's chateau Miraval estate in Correns, France. "Luigi is like family to me and I couldn't imagine anyone else making this dress," the Oscar-winning actress told People. "He knows and cares for the children and it was great fun putting it together." Pitt, who won an Oscar this year for producing "12 Years a Slave," wore a dark suit from his own closet and a tie borrowed from one of his boys because he forgot his own, the mag said. Jolie, 39, and Pitt, 50, wed partly because it was important to their brood and incorporated their children in several aspects of the occasion. "It was important to us that the day was relaxed and full of laughter," People quoted the newlyweds as saying. "It was such a special day to share with our children and a very happy time for our family." Indeed, every child played a role: The couple's eldest sons Maddox, 13, and Pax, 10, walked their mother down the aisle. Zahara, 9, and Vivienne, 6, served as flower girls, while Shiloh, 8, and Knox, 6, were ring bearers. The children helped write their parents' vows and Pax baked a cake, the mag said. People's wedding-album issue hits newsstands Wednesday. 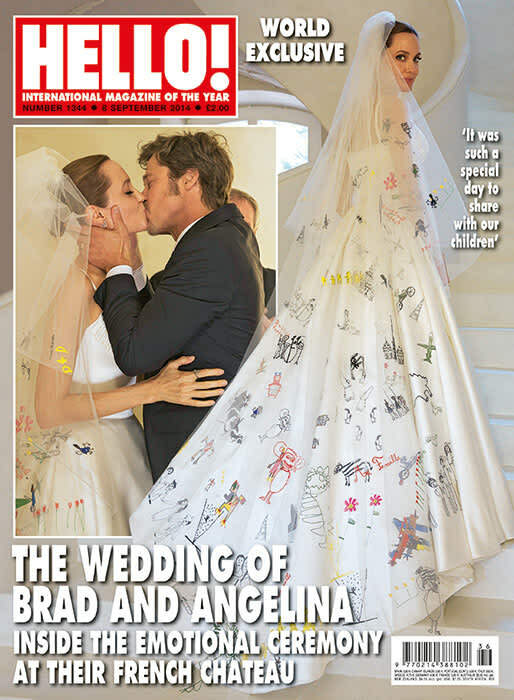 Hello, which boasts a shot of Brangelina kissing as man and wife, hit newsstands on Tuesday. It's OK to draw on Mommy's wedding dress, said no mom ever. Follow me on Twitter @NardineSaad.